Learn to create this Two-in-One Earrings on the fly! This tutorial is categorized under Mini Tutorial Series. I have included pictures of variations for this technique in the listing. These are not included in the tutorial. This design is tricky to compose although it looked simple, so beware. The tutorial delivers 29 simple steps to create this pair of earrings. Learn this to create them to have 2 pair of earrings with one-time effort! PLEASE BE INFORMED THAT THE "ALL Core TUTORIALS" package and "ANY 3 TUTORIALS" package does not apply to or include this tutorial. There are total of 29 steps in making this pair of earrings, to deliver the clearest instruction, the beautifully taken 56 pictures will provide you the means from end to end to make this pair of earrings. In this document, it also listed out the tools and materials being used. 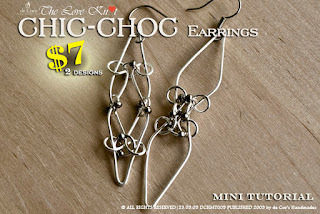 This lesson shows how to develop a pair of beautiful CHIC CHOC Earrings.